Richard Ayoade is to make a guest appearance in the revived Danger Mouse. The IT Crowd star plays a villainous snowman in the Christmas special, which will also star Brian Blessed as Santa. CBBC controller Cheryl Taylor said Santa was the role Blessed ‘was born to play’. 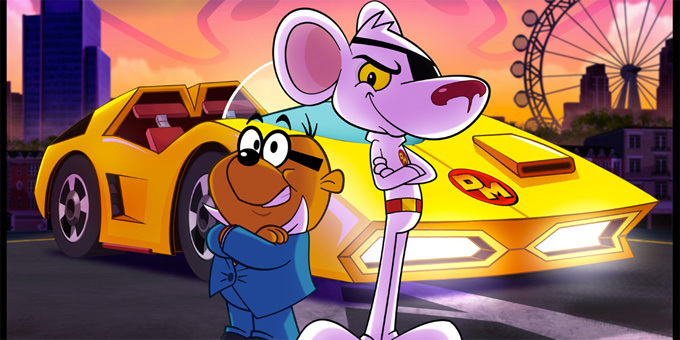 She also announced that the series – starring Alexander Armstrong as Danger Mouse and Kevin Eldon as his sidekick Penfold – will launch on September 28, 34 years to the day after the series first started. Also announced as a guest star today is Miranda Richardson, who will voice the Queen Of Weevils, who escaped Merlin’s clutches and now wants to take over the world. They join previously announced John Oliver as mad scientist – and wolf – Dr Augustus P Crumhorn III and Lena Headey as US Secret Agent Jeopardy Mouse. Armstrong also said was looking forward to original Danger Mouse actor Sir David Jason watching it ‘to see what he makes of it’. The series originally ran for 161 episodes from 1981 to 1992, attracting an astonishing 21.6million viewers at its peak in 1983. The revival also features Stephen Fry as Colonel K, Come Dine With Me’s Dave Lamb doing the voiceover and Morwenna Banks as The Queen.